For a thousand years, since their defeat of the Shadow at Eyr, the dragons have slept under the mountains. Now their king, Tarnamell, has woken. Driven mad by loneliness, he hurls himself south until he finds and tries to claim the Alagard Desert. Unfortunately, the desert already has a guardian spirit, and he doesn’t want to share. Amused by the cocky little desert spirit, Tarn retreats, planning to return in human form. Forced to take refuge in the Court of the Shells, a legendary fortress in the heart of the desert, Tarn, Gard, and their allies decide to seek out the Shadow before it destroys the desert. But to confront the Shadow, Tarn needs to gather his strength. A dragon’s power depends on the love and loyalty of his human hoard, but Tarn’s original hoard has been dead for centuries. Before he can face his most ancient enemy, he must win the trust of new followers and the heart of a cynical desert spirit. 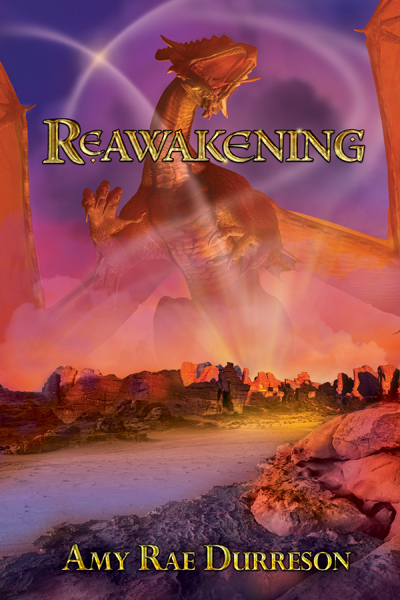 The second edition from DSP Publications also includes ‘Reemergence’, a short missing chapter about Tarn’s brother Halsarr, who will also star in Resistance. THE DRAGON came out of the cold north, riding the wind on vast golden wings. He had been sleeping for centuries, his dreams barely disturbed by the rise and fall of the great empires and realms of men. The mountains had grown wild around him; forests had hidden his resting place and had risen along the long ridge of his spine. Great spars of quartz had formed between his gleaming scales, and his claws had furred over with moss and lichen whilst sleep healed his wounds from the last great battle that had felled his brothers and nearly brought all that lived and loved in the world to naught. Meet the supporting characters of Reawakening….